Record Store Day is this Saturday, and there are plenty of special releases available for fans and vinyl collectors. 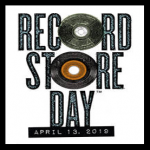 Brooklyn Vegan did a feature last week on RSD 2019 that are worth venturing out for, and it includes releases from AmApAc-affiliated artists including the bird and the bee, The Flaming Lips, and The Dream Syndicate. See the full list right here. Another great #RSD2019 release comes from Record Store Day itself – the 6th volume of an RSD-curated collection from the vaults of Sun Records. Get a digital version on our download page.